Portlet based web applications built with the IBM Web Experience Factory, previously known as the WebSphere Portlet Factory, produce long URL's containing GZIP'd and base64-encoded data. Viewing and tampering with the data transmitted between the client browser and backing application server is quintessential to application penetration testing. The WebSphere application server provides a servlet that decodes the state information. The request structure to decode state information is shown below. If you make a request with the first URL, you get redirected to the second URL which presents the decoded data. 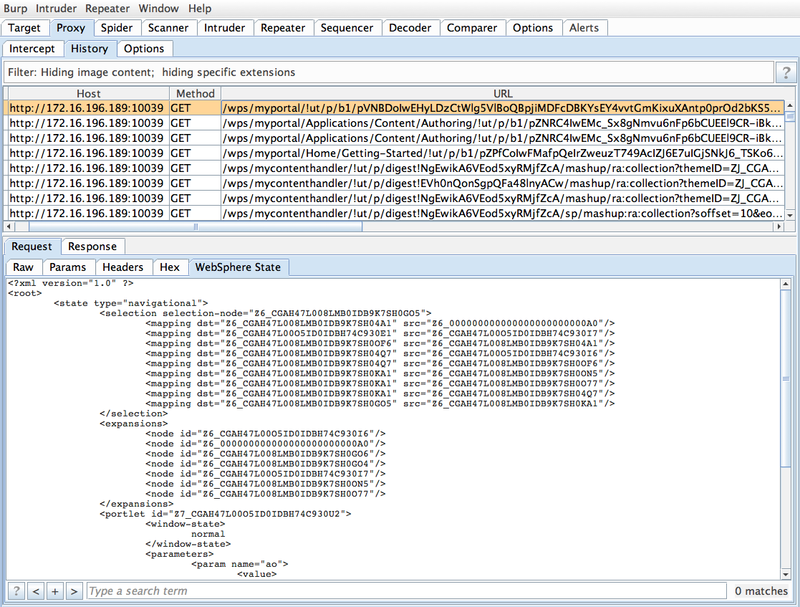 I wrote a BurpSuite plugin that displays the decoded XML state in a new tab when the request is viewed (https://github.com/AccuvantLABS/burp-ibm-websphere-portlet-decoder). Upon clicking the tab, the plugin makes a request against the endpoint on the application server that decodes the URL (shown above), formats the resulting XML and displays it in the tab. Note: The plugin does not cache or temporarily save the decoded state data, it is requested every time the decoded state tab is viewed. Raffi Erganian is a principal consultant with Optiv's application security practice. He provides clients with expert consulting services on application and software security, including the delivery of security assessments, penetration testing, secure code review, SDLC analysis as well as project management, security research, and development of tools and testing methodologies. He services Fortune 500 companies in a variety of industries, including financial services, health care, utilities, E-commerce and insurance.